In my three-dimensional installations subjects are made tangible and experienceable by time, space and movement. My project ‘Cloud’ for the exhibition ‘I promise you a rose garden, is a continuation of this line of work. ‘Breathing Cloud’ is a three-dimensional installation in the line of earlier ‘wink’ productions such as ‘Just a minute’ and ‘Cube’. ‘Just a minute’ (Boulevard Theatre Festival) focused on a wink, ‘Cube’ (Guardianenhof) on a drop of water. Now the cloud will enter into an interaction with the audience. An amorphous, breathing shape occupies the space of a large greenhouse, filling the atmosphere with pink light. ‘And it isn’t all romance either, as one artist claims more space in the “Rose garden” than the other. In Dorette Sturm’s case, there is good reason. Sturm’s “Cloud” is spectacular. 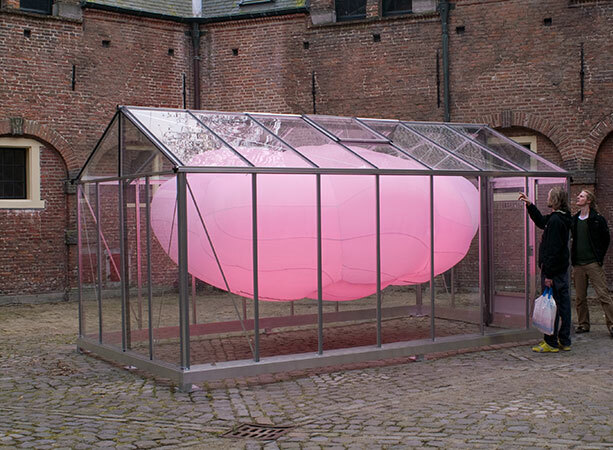 A pink cloud made of spinnaker canvas, illuminated from within, is located inside a greenhouse. The “Cloud” is constantly inflated with air, breathing slowly like a monstrous “blob” in a cage.’ Mark van der Voort, Brabants Dagblad, March 27, 2007.